As I’ve written before, last year was a bit of a challenge. Turned 50 at the beginning of the year in the midst of one of the most fiscally austere points of my life. Let go from a meaningful, rewarding job in an extremely humbling, demoralizing way. Exhausting issues in other areas of my life. Two outpatient procedures (D & C and colonoscopy) plus a stress test causing fear and discomfort. Being diagnosed with hypothyroidism caused by Hashimoto’s disease. It was definitely not the light, carefree year I had hoped for…frankly I was looking for a repeat of 20 years ago when I turned 30! Now that was a fantabulous year! However, one of the main things that kept me going throughout the year was my involvement in Recovery on Water and the amazingly supportive relationships I have built with my teammates, our coaches, and so many of the wonderful volunteers that keep this team for those diagnosed with breast cancer rowing along. Despite money being snug last year, I didn’t have to give up my involvement with ROW thanks to ROWs mission of being there for those with or without the funds. I found only kindness and understanding when I needed to minimize my financial contributions/dues to the team–which would not have happened with a traditional master’s rowing team. I was even blessed when a very generous anonymous donor and supporter of ROW provided a dozen scholarships to attend ROW’s Power 10 camp in early June at a beautiful camp in northern Michigan and I was given one of those scholarships. What a fantabulous experience! So grateful. This year’s Sprint for Recovery route was over 15 kilometers round trip!! When I was diagnosed with hypothyroidism in October, my amazing coaches worked with me so that I could continue rowing while I figured things out. They helped me craft a plan where I would maintain my endurance and strength throughout the winter indoor rowing season, just not focus on my speed. Sheena–my novice coach with the mostest, whose dad has had to deal with thyroid cancer in the past 3 years–helped me modify my workouts–and then started nudging me this past month when I was holding on to the security blanket of stabilization too long. Lindsey–who has earned medals for rowing at World Championships and is a rockstar–suggested I track calories rather than speed (which I had been tracking for my prior 3 years with ROW) so I wouldn’t feel depressed about how slow I was rowing compared to a year earlier. And Lily patiently let me set my erg pace at practices–and regularly followed up to check on how I was doing. Their individual support and attention was so crucial!! The ‘getting it’ aspect we share isn’t solely reserved for discussions of breast cancer and so being able to continue with ROW despite economic hardships last year meant I could continue to receive the support of my teammates as I was dealing with the drama going on in my world. Attending practices, events and ROW Power 10 Camp meant that I was still present and active with ROW and could continue to receive the amazing support of my teammates through conversation, laughter and shared experiences. Fellow South Sider Karen’s heart to heart’s about relationships was extremely timely. My roommate at ROW’s Power 10 Camp, Amy, received quite an earful and was amazingly kind and supportive, as was Program’s Committee 2018 member, Deb, as we traveled to and from camp. And I can’t forget Robyn, who was really a great sounding board with discussions of networking possibilities. In the fall, as soon as teammate Elaine heard about my diagnosis, she had me networking with her aunt, an endocrinologist. Teammates Sandra and Julie intently listened as I tried to sort out the hypothyroidism thing and than followed up regularly to see how things were progressing. And so many others expressed care and concern when I shared my You Are Feeling Very Sleepy… blogpost with the team–with special affection from fellow Novice 2015 newbies Mary, Sara and Katie B . Pretty incredible. That’s the thing about a team like this. No one person can be everything to someone, but a team–a collective group of super cool people–like ROW can make a world of difference and has for me. Now we are in March 2019 and my life is starting to feel that maybe I may be in a very different place than last year at this time. Take that! Fellow dog walker, Joan, not only introduced me to ROW 4 years ago in March, but she planted the seed of my wanting to row in the annual Sprint for Recovery. I tried to go out with the rowers for Sprint for Recovery in 2016, but didn’t register in time and so was on the waitlist. Jenn, ROW’s co-founder and one of the most inspirational women I’ve ever met, told me before that sprint that someone always drops out. Well, in 2016, that day was beautiful–and no one backed out. Still had fun being involved, but I wanted to be on the water. In 2017, I registered early, did my fundraising and was all set to have a seat in one of the boats…but it was too cold on and off the water to go out, so we had relay races inside instead. Last year, I sat out, but this year? I wanted to be involved badly and while I actually had the option to do the new indoor sprint option, this water baby wanted to be out on the water and so that is what I signed up for. I was a little worried there with everything, but the stars aligned and it happened!!! Despite everything, I got to go out this year and it was truly magical! Such a great day and the behind the scenes support of our coaches (new head coach Austin is quickly making himself the invaluable fixit man), coxswains, and volunteers was amazing! It got pretty crazy there where the water was dyed green with all of the boat traffic and humanity, but calmness and level heads prevailed. Excellent work! A great pic by teammate, Amy B!!! According to Ancestry, I am down to 5% Irish/Scottish DNA from 23% Irish/Scottish DNA when they recently re-tabulated their data. Out of my 8 great-grandparents, none have a direct line to Ireland (birth, life there, etc.) nor did any of my 16 great-great grandparents, so I was definitely not raised identifying as even partially Irish. 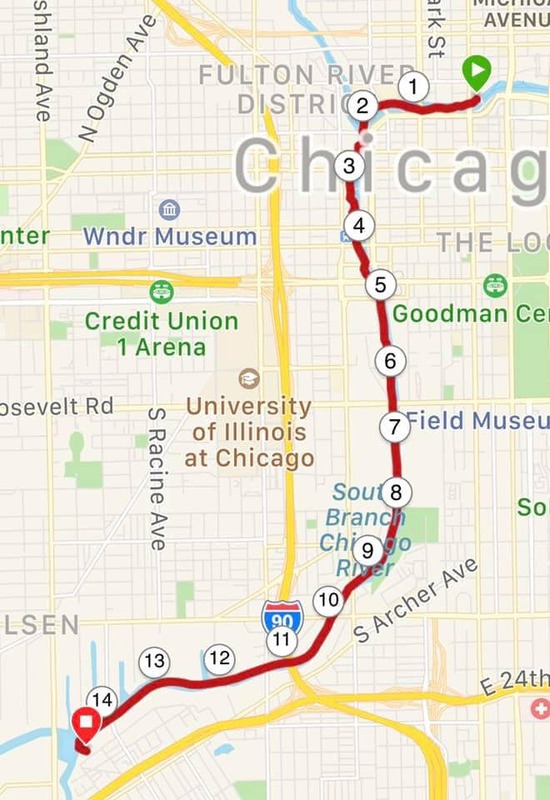 However, I have always liked St. Patrick’s day parades and celebrations here in the U.S., it’s just they weren’t that big of a deal until I moved to Chicago–where it is a big deal. People are ready to get outside and play after a cold, grey winter and so St. Patrick’s Day it is. 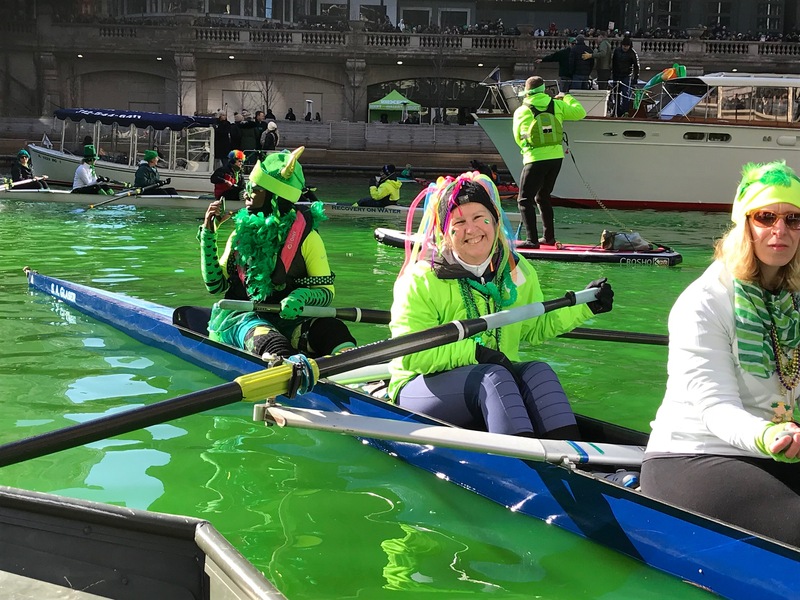 There is an annual street parade in Beverly and there is the tradition of dyeing the Chicago River Green, which has been going on for over 50 years! This entry was posted in Being Active, Breast Cancer, Exercise, Go Row, Health, Living Life Fully. Bookmark the permalink. You are welcome! It was fun & chilly! Thankfully I did some pretty serious layering. Today was ‘springy’ here. Upper 40s here near the Lake.